The theory of competition has held a central place in economic analysis since the time of Adam Smith. 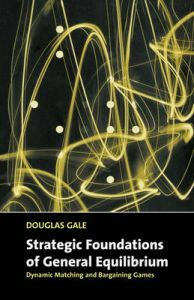 This book, written by one of the most distinguished of contemporary economic theorists, reports on a major research program to provide strategic foundations for the theory of competition. Making use of insights from game theory, search theory and bargaining theory, the author develops a model to explain what actually goes on in markets and how a competitive general equlibrium is achieved. Essential reading for graduate courses in game theory and general equilibrium.